Etching and aquatint printed from two plates, a fine, extremely fresh impression of the only known state, the full sheet, printed on white wove 1964/Samuel Flax paper, with margins, hand-signed and dated in pencil by the artist, published in an edition of 144 (there were also 8 Artist’s Proofs, 1 Printer’s Proof - which this is - and 8 Trial Proof’s - all in the collection of the Art Institute of Chicago), printed by Donn Steward at ULAE, Bay Shore, New York, published by ULAE for the List Art Foundation, New York, in very fine condition, unframed. Sparks, Esther. Universal Limited Art Editions, A History and Catalogue: The First Twenty-Five Years. 1989, Chicago, The Art Institute of Chicago and New York, Harry N. Abrams, p.290, no.10, illustrated (this example). 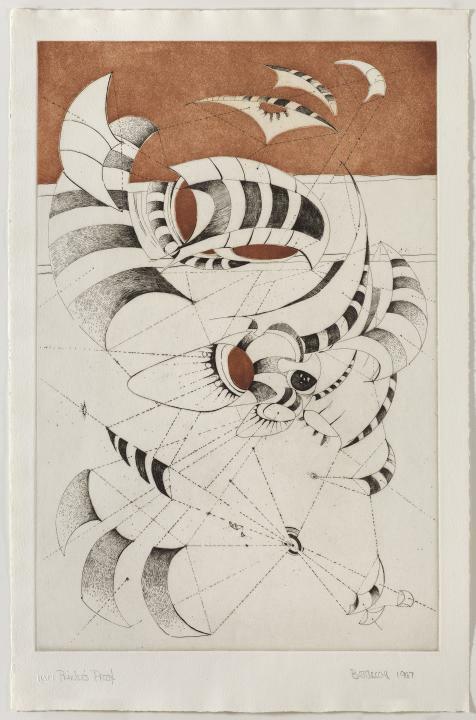 Untitled Etching was commissioned by the List Art Foundation, Inc. for a portfolio of six prints commemorating the opening of the National Collection of Fine Arts, Washington, D.C.. Bontecou was the first artist to complete her work. After she signed the edition that was on Flax paper, offset plates were made for an unlimited poster edition, which somehow acquired the title “Wish Well”. Untitled Etching was a stylish counterpart of Bontecou’s new, the first image to be published representing a new direction in her work. Its delicate, spiky forms are lighter like her new sculpture of the time and like the present work, the sculptures impose no fixed view point on the viewer and do not imply physical attachment to a wall.